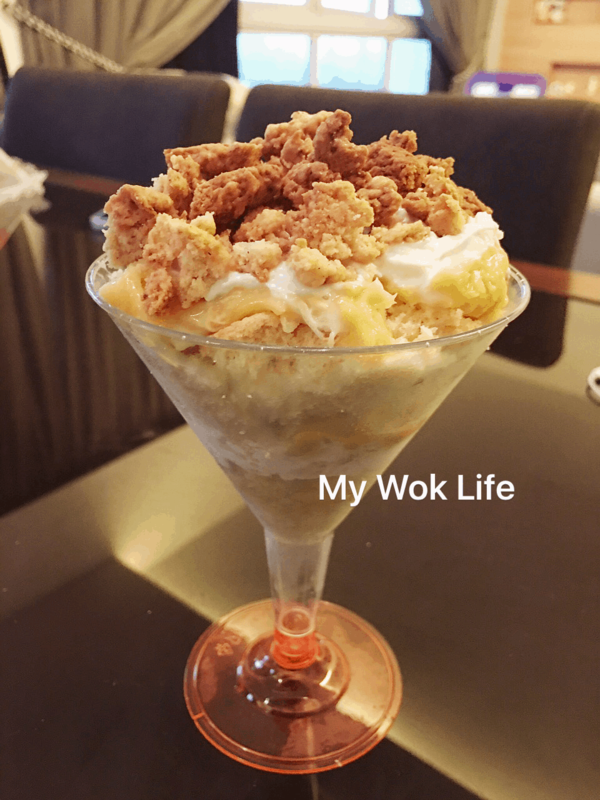 The super aromatic and crunchy banana crumbs as the topping is something you wouldn’t want to miss. 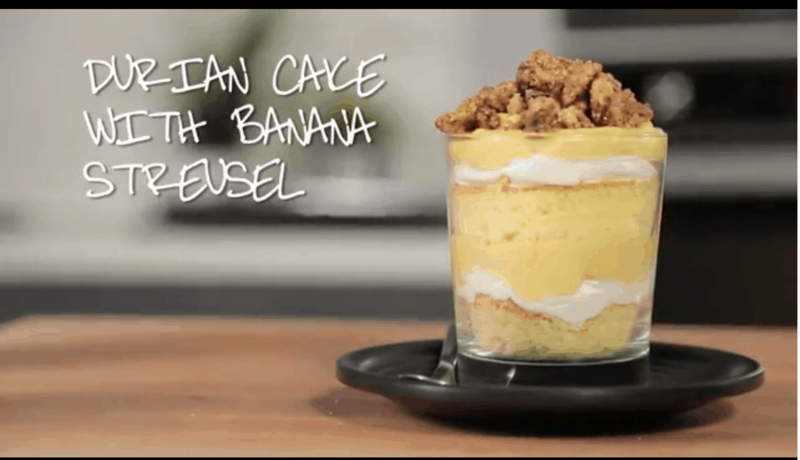 Make sure you have it to compliment this durian cake in glass well. This durian dessert is not difficult to assemble. With its beautiful presentation, it’s definitely something for you to show off and proud of. Preheat oven to 170deg Celsius. Combine all ingredients (A) in a mixing bowl and beat on medium speed for 8-10 minutes, or until pale and fluffy. Pour into lined square baking tin and bake for 20 minutes. When baked, set aside to cool. To whipped cream: Whip heavy cream in a completely dry and cold mixing bowl on high speed until soft peak. Add sugar and vanilla essence, continue beating until stiff peak. Spoon whipped cream into piping bag. Chill it for later. To purée durian: Mash durian flesh with fork. Add heavy cream and sugar to combine well. Spoon durian purée into piping bag. Chill it for later. To assemble the sweet treat: Use a cutter that fits your glass to cut out the layers of cake. Place a slice of cake layer. Pipe a layer of whipped cream, followed by a layer of durian purée. Top another layer of cake and repeat with whipped cream and durian. Impress your party crowd or guests with this! Tips: If you think the durian tastes sweet enough, omit sugar. If the texture of the durian you have is the wetter kind, omit the heavy cream. 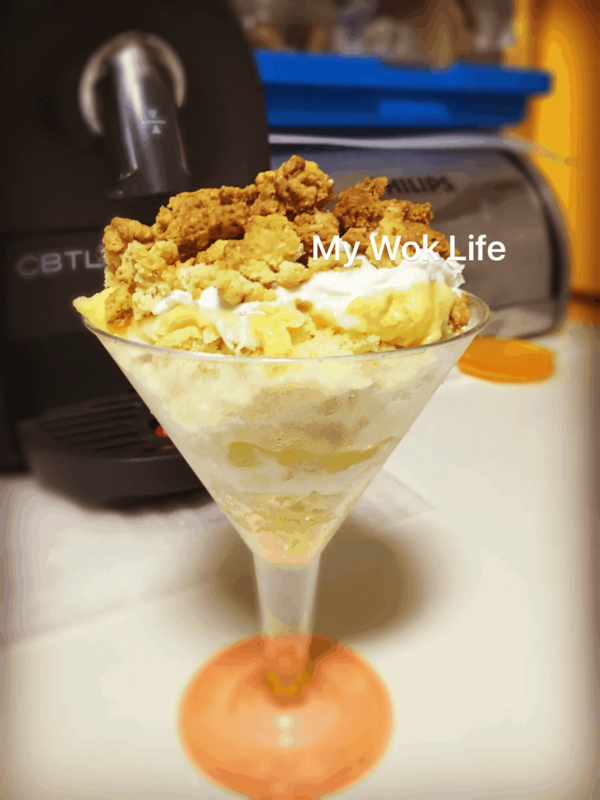 If you prefer to taste more of the original flavour of the durian, omit both sugar and heavy cream. *Use a really cold mixer and bowl to whip the cream. Suggest placing the mixing equipment into freezer for at least 10 minutes before use. *Use any type of glass or cup to serve your durian dessert. * Monitor the baking of banana streusel to avoid burning.